#CSR Communications should be simple. Tell stories, communicate value and #SDG impact. If you have ever heard of the KISS acronym, you know it stands for “keep it simple, stupid” — or, more nicely put, “keep it simple, sweetheart”. The KISS acronym has been used as a way to teach people to keep things simple and to the point instead of diving into the rabbit hole of unnecessary complexity. It’s a principle that’s usually applied to writing and design, and even business or elevator pitches. But it can also be applied to your Corporate Social Responsibility (CSR) communications strategy. Being able to easily communicate your CSR project’s goals and objectives is not only a useful tool, it is necessary to ensure stakeholders and other audiences understand and are supportive and on board with the goals of your work. If you are having difficulty breaking down your CSR project in a simple and straightforward way, it likely means you either do not understand the plan well enough or the plan is overly complicated. We suggest looking at your communications with these nine simple touchstones in mind. Focus on the value created. 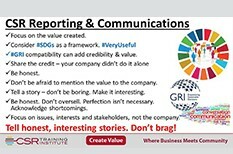 #GRI (Global Reporting Initiative) compatibility can add credibility & value. Don’t be afraid to acknowledge the value to the company. Tell a story – don’t be boring. Make it interesting. Be honest. Don’t oversell. Perfection isn’t necessary. Acknowledge shortcomings. If you are unable to make your CSR communications easy to read and digest, I recommend taking a closer look at your projects and work. I often remind the clients I work with that CSR is simple, but it is not easy — it is important to ignore that which is too complicated and stay focused on the simple stuff. Many companies I’ve worked with have started out with plans that were far too ambitious and they were never able to escape the complexity — because they were far too immersed. If you find yourself at this point, it may be necessary to put things on pause and look at the strategy behind how you are doing CSR. Taking a step back and look at it objectively, or get a set of experienced fresh eyes to come and do a strategic review. This type of review could be the highest return on your CSR investment your company ever makes. At CSR Training Institute, we understand that CSR strategy is key to creating value, for society, and for shareholders, and that it is easy to get too complex and miss the alignment between social impact and business value. We also understand it can be difficult to determine how to communicate about your work. That’s why we are here to help.